For any enterprise to remain competitive in modern markets, its goals are twofold. First, it must consistently strive to introduce its features, applications and solutions as rapidly as possible, and second, it must seek the most effective method to simultaneously achieve scale economies while keeping costs down. If your company currently uses MySQL or any similar relational database, Redis can help you achieve both of these goals and more. Redis is a high-speed, low latency, in-memory database, making it the perfect supplement to MySQL. It’s extremely fast and flexible, and it’s easy to incorporate into your existing architecture. Redis also strives to tackle the four most common obstacles that arise when exclusively using a traditional MySQL database: unsatisfactory user experience as a result of slow read/write speeds; unnecessarily long development and deployment times for new applications; prohibitive scaling costs; and low load limits that can lead to application shutdowns. When incorporating Redis into your MySQL, Redis would be a “system of engagement,” while your MySQL database would be your “system of record.” With its diverse range of built-in data structures, Redis optimizes user engagement and experiences but stays in the background, ensuring that your database’s day-to-day functions will not face any disruption. When you use Redis as a system of engagement, it can cache, store, track and scale hot data that will be served to active users, while MySQL maintains a true copy of all data. To learn more about how Redis can be incorporated into your existing MySQL architecture, please download our white paper. Given its flexibility and consistently high performance, Redis is often described as a “Swiss Army knife” for developers. Redis can be used as a message broker, data structure store and temporary data store for a variety of use cases, and is ultimately able to deliver data to users in the quickest and most efficient way. Because it is both cost-effective and lightweight, Redis can be deployed in multiple ways: as a software on-premises, as a container or on the cloud. For additional cloud adoption and production platform needs, you can supplement your existing architecture with Redis Enterprise, which offers enterprise-grade high availability, auto scaling, high throughput and 24×7 technical support. Redis’ flexibility is further showcased in the various solutions it offers as a cache, session store and real-time tracking tool. It can help MySQL maintain data consistency, and by persisting and replicating data behind the scenes, it can ensure that your MySQL does not suffer from any data loss — even during node failures. 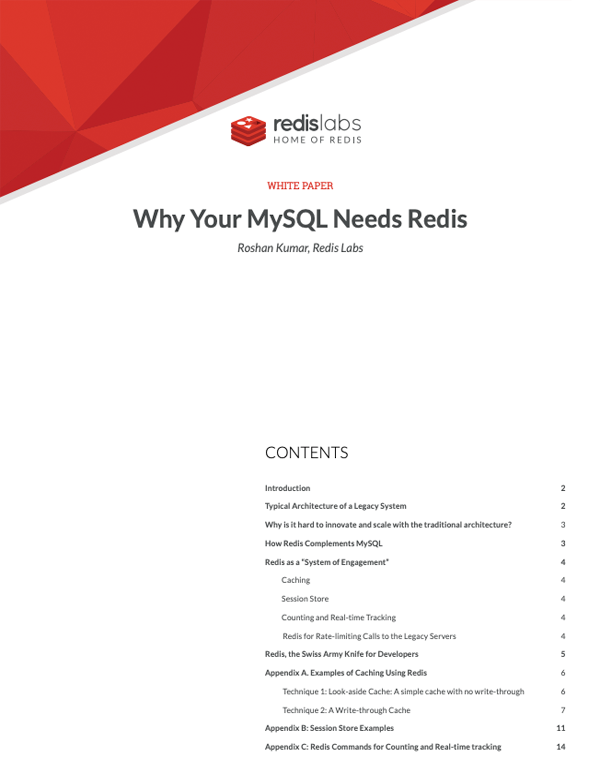 For a detailed breakdown of the various use cases in which Redis can augment your MySQL’s performance, please refer to the appendices of our white paper.